This article appears in print in the October 2018 issue, as part of the Scenic Fall Road Trips cover story. Click here to subscribe. It’s tempting, especially if you’re traveling from Seattle, to stick to the south end of Whidbey Island. After all, you’ve just driven up to Mukilteo and ferried over, and there’s plenty to do here, with Langley not far from the ferry terminal, along with beaches and views. Trekking up the rest of the long and narrow island isn’t necessarily a quick jaunt. 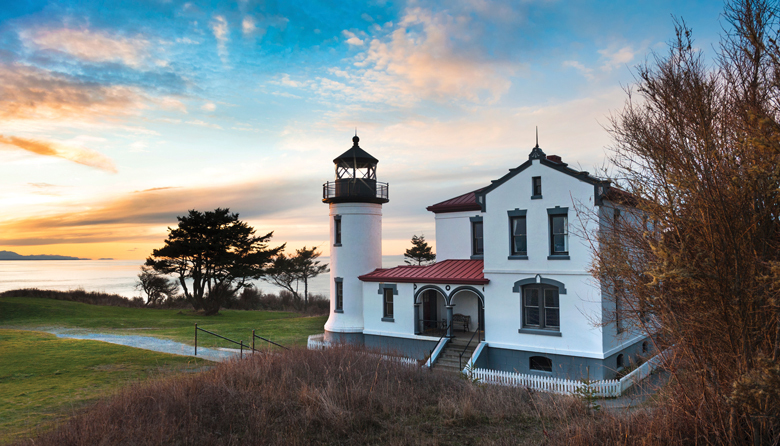 However, some of the most outstanding views are to the north as part of Ebey’s Landing National Historical Reserve, composed of vast beach, prairie vistas and a lot of history. The town of Coupeville is also here, where good views and bites abound. To get the most out of your scenic drive, plan on a bit of zigzagging, with some time spent on the main route that runs along the length of the island, State Route 525. That road intersects with and turns into State Route 20 in the vicinity of Keystone. After your arrival at the ferry terminal, wet your whistle at Whidbey Island Winery, a small and friendly farmhouse-style spot that makes a variety of interesting reds—including a Lemberger and a Whidbey-sourced Pinot Noir—whites and a port. From here, head back along Langley Road to SR 525 to find Bayview Farm and Garden, a beautiful nursery with an in-house café and a human-size chessboard on the grounds. From the nursery, get back on SR 525 for a short stretch to Double Bluff Road and turn left to arrive at Double Bluff Beach, a spot that will have particular appeal to anyone traveling with a dog. One end of the beach is off-leash paradise for your pup, and the other is packed with colorful kiteboarders bobbing and drifting in the air over the water. Historic Captain Whidbey Inn is a great resting spot. Photograph by Captain Whidbey. Back on the road, head toward Coupeville. The tree-lined drive is serene, and as you near Coupeville, the landscape opens up. Watch for several pumpkin patches that are open during October, including Sherman’s Pioneer Farm, on South Ebey Road, a popular patch that features a trolley ride on Fridays and Saturdays. A bit farther on is Coupeville, a gem situated on Penn Cove and the home turf of those locally famous mussels. Get them—and pork belly, and much more—at The Oystercatcher, a cozy dining spot with some tasty fare. If you prefer your shellfish by the pot-full, paired with a local pint (here, that’s Toby’s Parrot red ale), go to laid-back Toby’s Tavern, a building that started as a mercantile in 1890. There are plenty of shops to browse and water views to take in here, but if you’re in town on a Saturday, visit the Coupeville Farmers Market (which runs through October), where you can find produce, fish and locally made products, such as North Whidbey Farm’s decadent cajeta (caramel sauce made from goat milk). The Oystercatcher’s broiled Stellar Bay oyster with hazelnut butter and bacon jam. Photograph by Sara Hansen. Coupeville is part of the larger Ebey’s Landing National Historical Reserve, a historic farming area that includes Fort Casey Historical State Park, a 999-acre park that’s more than 100 years old and features a vintage lighthouse and underground bunkers; and Fort Ebey State Park, 461 acres of windswept prairie majesty with bluff views that will knock your socks off. There’s 25 miles of biking and hiking trails to explore—which probably means you’ll have to come back. Or, you can extend your visit with a cozy overnight stay at nearby Captain Whidbey Inn, whose new owners are working to update the historic property. The next day, complete your trip up the island by heading farther north to Deception Pass State Park and Rosario Beach, continuing east on State Route 20 until you hit Interstate 5. From there, you can return to Seattle, sans ferry, in about an hour and a half. Take I-5 to Mukilteo—about a 40-minute drive north from Seattle—where you’ll catch a Washington state ferry to Whidbey Island. Coupeville does Halloween right throughout the month of October with a variety of activities, including a Scarey-Crow Trail, a Weary Bones Rest Stop Graveyard, a haunted barn and a Halloween Torchlight Parade (coupevillechamber.com).